So I’ve been wanting to do a “giveaway” for a while now and I finally decided that now, with the holidays coming up, would be a perfect time for this! 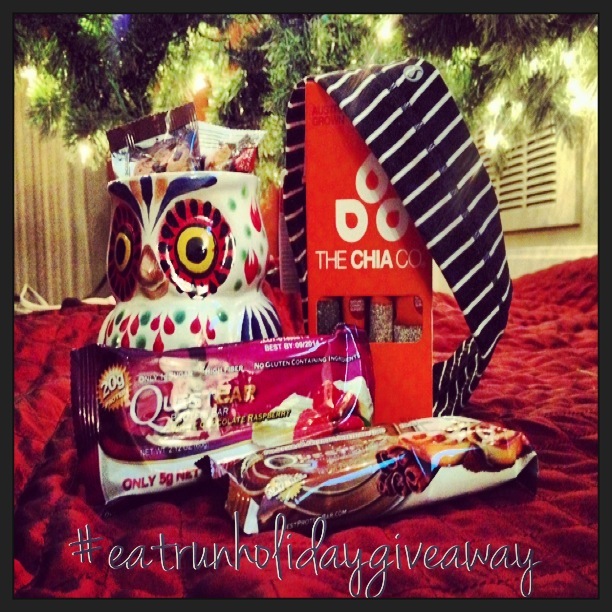 Through my @eatrunandallinbetween Instagram account and my blog, I’m hosting my first official #EatRunHolidayGiveaway !! I’m doing this for a number of reasons. As I’ve definitely discussed before in previous posts, I honestly started this blog a little over a year ago with no plan or serious aspirations for it. However, over time, it’s something that has quite surprisingly grown near and dear to me. Establishing my Instagram account was one of the next big steps I took following the blog that too, has helped to establish my Eat, Run, and Everything in Between blog as a ‘brand’. Now, I use the term ‘brand’ loosely. This is my own PERSONAL brand. Not the type of brand that sells products or services, makes revenue, has investors, etc….you get the idea! Anyway, MY brand is how I chose to portray myself through social media, whether it’s personal or in the work place. I wanted to express myself through something I was passionate about, which just so happened to be healthy living and fitness. I feel this is both a positive brand/image that represents me in a positive light and is certainly something I want to continue to promote for the benefit of myself and everyone else included. Anyway, before I go too far and blab on and on, I want to get back to the reason behind my giveaway. Going along with my brand and sharing my views on a healthy, balanced lifestyle…it wouldn’t be anything at all without all of my AMAZING supportive and inspiring followers. YOU guys keep me just as motivated as I hope I keep you and you’ve inspired me to maintain focused on what I really enjoy doing. With that being said, I wanted to find a way to BOTH thank you all for your incredible support AND selfishly, further branch out of my comfort zone through a few tips I learned in my marketing and business classes…create GIVEAWAYS! I decided that for every big “blog/Instagram” milestone going forward, I will continue to host random giveaways, because I most importantly want to show you all my gratitude and appreciation! –	Why? Well, for 1) how cute is this own mug? ?, 2) I LOVE mugs, whether it’s for my coffee (I wouldn’t be functioning without that! ), my tea, my oatmeal, my mug cakes (I wonder if this would mold an owl mug cake?? ), etc., Basically, mugs are MY LIFE. 3) And, lastly, there’s something so nice and peaceful about having a mug that fits your personality, with a cup of joe, relaxing on a Sunday morning…seriously, nothing beats that! –	Why? Because, who doesn’t love lululemon AND their headbands? But, more importantly, this represents the runner in me! I love to run and still want to run competitively in halfs and road races (even after years of highschool/college track!!) But, just because I’m serious about running, doesn’t mean we can’t express ourselves through what we wear! –	Why? I wanted to include some of my favorite food items! First of all, I use chia seeds in EVERYTHING. They’re a great healthy source of omega and other awesome nutrients. You can throw them in literally everything (oatmeal, smoothies, salads, parfaits, mug cakes, etc.). Plus, how cool are these mini “shots”??! I also included quest bars…well, because THEY ROCK and I’m obsessed, along with the rest of the “fit world”! Quest bars are gluten free, all naturaaaal, and have up to 20+ grams of protein! Plus, they’re easily the BEST tasting protein bars I’ve ever had! They’re even 10x’s better when you toss them in the oven to bake for a few minutes! **So, that sums up my entire giveaway package…now for the logistics/details. -You can either enter through Instagram or my blog. -The other option is to follow me AND tag me on Instagram, @eatrunandallinbetween, repost any picture I’ve posted of the entire holiday package, AND hashtag #eatrunholidaygiveaway …again you’ll be automatically added to the random raffle and same rules/dates apply! I’ve been thinking of hosting a giveaway myself and just need to figure out some logistics, but yours sounds absolutely wonderful, and I haven’t tried chia seeds so I need to get on that haha. Also my name is Katy Hancock and my favorite gym go-to are the fitness classes, especially Zumba! let me know if you have any questions about it, but thanks for your submission and i LOVE zumba, so fun!! Hey! My name’s Amanda Adsit and I absolutely love doing a HIIT workout either running, on the elliptical, or in the pool, followed with some sort of toning, such as pilates! Hi Amanda, thanks for your submission! and yessss I’ve been really into HIIT lately as well, it’s a great workout! Hi, I’ve been reading your blog for a while now. Everything you have in your giveaway sounds amazing and like the best christmas present any fitness lover would crave! My name is Katie Trainor and my favorite gym go-to is definitely a spin class! Hi Katie, aw thank you!! I was trying to think about a giveaway that had all my fave things/was something I would really want 🙂 and ah, I actually haven’t gotten into spinning yet, I want to try it though! My name is Shannon and I love a Barre Express class! Hi Shannon, thanks! I just tried Barre for my first time a little bit ago and loved it!